Cinco De Margo – Saturday! Technically it’s Ocho De Margo, but when it comes to supporting the best thing going in Seattle DIY it doesn’t matter what it is. You need to be there. Lots of food, great people, music, and yes…skateboarding. If you haven’t been down there in a while, you should check it out. There are some exciting new developments taking shape underneath the highway. If you can’t make it, you can always donate by using PayPal. When you’re done paying $30 to skate over at SeaSk8 during Bumbershoot, you should head over to the Funhouse for the Marginal Benefit. 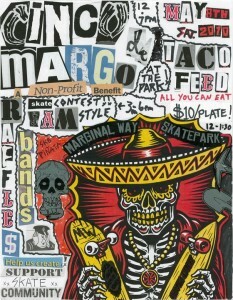 Fri 9/4 – Marginal Way Skate Park Benefit! Sat 9/5 – Unrelated show. 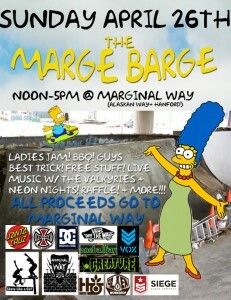 Sun 9/6 – Marginal Way Skate Park Benefit! 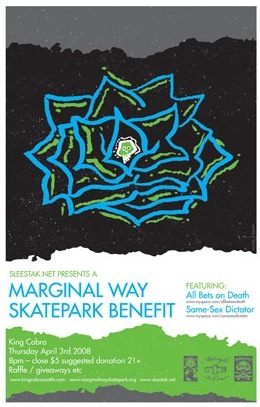 Mon 9/7 – Marginal Way Skate Park Benefit! The hater in me wants to be all… “every day is go skateboarding day, man”, and “don’t try to turn this aspect of my lifestyle into a Hallmark holiday you evil corporate skateboard/lifestyle brand managers”, but I am really trying to be more positive these days. I ventured out. Go skateboarding for yourself, and no one else. Marginal was probably empty because the SnoCon guys were hosting an awesome event down the street, and I’m sure it fired up later in the afternoon. Josh Becker captured some awesome photos of the downhill bomb, which you can see here. But having Marginal to yourself on GSD seemed like an oddly beautiful way to spend the day. This is a solid event. The cause is great, the bands are killer, and it’s always good to support SLAG. Which, in case you have been sleeping under a rock for the last two years, is becoming an increasingly positive force in the Northwest skateboarding scene. If anything, you should take any chance you get to see Neon Nights. If you don’t like the spot because it’s too gnarly, stop by and drop off some money. If you can’t even do that, donate from the computer you’re on now by clicking here. Thursday, April 3 (8pm – close, $5 suggested donation, 21+). 2008: The year of the Seattle Skatepark? For skaters in Seattle, last year kinda sucked. It started off crappy. 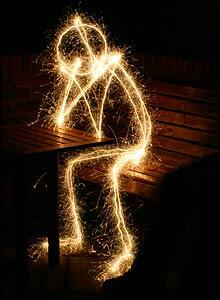 I remember January 3rd, 2007 like it was yesterday. I was sitting at my desk at work, and someone from the Stranger called to ask me how I felt about the demolition of SeaSk8. I had spent the previous 4 years on the SPAC, going to countless meetings, but for some reason no one at Seattle Center felt like notifying any of us about the scheduled bulldozing of a beloved Seattle skatepark. As 2007 rolled on, the Seattle Center staff, who report to Mayor Nickels, continued to play a shell game with the new location for SeaSk8. Corporate tenants the Experience Music Project, Pacific Science Center, and the Space Needle, fought successfully to keep the new skatepark out of the best location on Broad Street. David Della’s Parks committee then chose a new site on top of a beloved piece of art work. Finally, the City Council, tired and bewildered after years of squabbling over what should’ve been a no-brainer, forced the park into it’s current 2nd and Thomas ‘Pavilion’ site to the tune of 4+ Million dollars and the demolition of an actively-used building. But things were looking up around August when Kris Fuller gave up on her costly litigation against the Lower Woodland skatepark. However it was not good news when it was said and done. She succeeded in stalling the park’s construction for over a year, and sapped over $20K out of park’s budget in delay and cost increases. In West Seattle, a few angry neighbors managed to intimidate the Parks Department into pulling skateparks off of two improvement projects. At Ercolini Park, the organizers of the project didn’t even understand why Parks had removed the skate dot from the plans, because “one person had some concerns about noise but that was about it”. At Myrtle Reservoir, 20 neighbors showed up and voiced concerns about crime, degenerate skaters, and a general decline of peace and civility that the skatepark would bring. Further investigation into the emails sent to the Seattle Parks Department told a different story, where neighbors were simply afraid of the kids in the lower income High Point neighborhood coming to play near their houses. More great news washed over the group that’s been successfully heading up the River City Skatepark project in South Park. They were awarded the remainder of the money they needed through a Department of Neighborhoods grant. This signaled the end of a very positive and successful process in which a community will be building a skatepark that has been entirely funded and driven by citizen effort, totally outside of the Parks Department process. The city-wide skatepark plan was adopted, ushering in 27 pre-vetted sites as a result of an exhaustive 9-month public process. Marginal Way poured a huge slab of flat and some more transition, cementing their place as a monument to Seattle skateboarder tenacity, dedication, and incredible sense of community. 2008 may very well be a pivotal year in Seattle’s skatepark history. Lower Woodland will be completed in a few months, and SeaSk8 construction will begin. 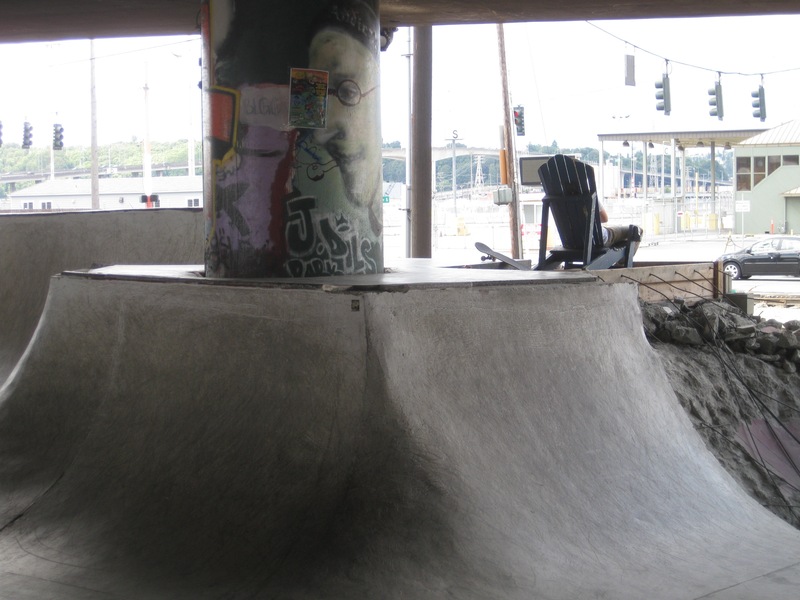 River City will also be completed, and there are currently efforts in City Council to get funding for skateparks in Judkins, Jefferson, Delridge, and Roxhill. A skatedot fund is also being discussed. It’s wise not to get your hopes up, as we’ve learned after repeated stalls and bumps along the road to getting more skateparks built in Seattle. But an optimistic eye would see at least a few great opportunities to turn this train around and get Seattle back on the track to becoming a great city for young and old skateboarders alike in 2008. Dav & Jessica, Danarchy, DJ Racoon, and R.R. Pete. This just came in from the Marginal Guys. Support them and have a good time doing it! BBQ is going to be fun food, skating, game of CRETE (our version of SKATE) and music. Plus our pal Quincy Quigg illustrated a cool new shirt for us that will be for sale during the event. come down and see what going on at your local Seattle DIY park and help us celebrate and make some money for the start of Fall 07. This came in from the Marginal Way Collective. Please support them by all means necessary! improvements as their contribution to the cause. We will work all weekend of July 27-29 (a new pour!) and will need as many hands available as possible. This will be a great opportunity to gain some concrete experience and help the skatepark enter Phase 2. There’s a bunch of good stuff happening in and around the Marginal Way skatepark. Please support them! 1. 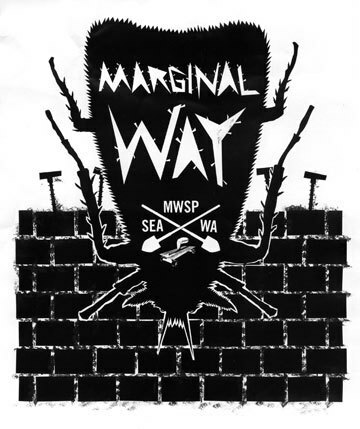 New Marginal Way tee! $15 online (use paypal) or $10 at local sk8 shops. S, M, L, XL, XXL (Light grey shirt w/ black front print). So far we have them in Snowboard Connection (Seattle location), and soon they will be in Bomb Shelter, 35th, and possibly a few other shops. Thank you Stone Fly Chris for donating the tees and the printing (again). 2. Snowboard Connection is hosting a game of skate at Marginal Way on Tuesday, June 19th – 3pm FREE ENTRY! Come down and enter or watch. We will be there selling MW tee’s, water, and maybe BBQ? 3. Along with this event SnoCon is hosting a HUGE day for the upcoming Go Skate Day on Thursday, June 21st. Element Video premier at Capitol Hill Arts Center at 5pm, BBQ, and skate jam at SnoCon at 7-9pm, and then back up to Capitol Hill Arts Center for live music after party from All Bets On Death and Marginal Way 21+ 10pm. 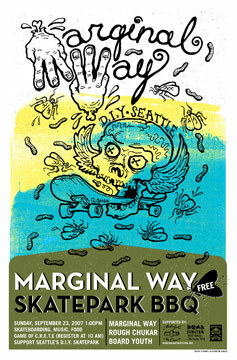 Plus $1 PBR beers with all the beer money going toward more material for Marginal Way Skatepark. Go to the SnoCon website blog for more info. You are currently browsing the archives for the 'Marginal Way' category.